​Rain gutters need to be cleaned on a regular basis in order to prevent downspouts from clogging and to keep mold and algae from growing. Regular rain gutter cleanings do more than ensure that your rain gutters work as they should, they extend the life of your your gutters. Your gutters should be cleaned twice a year to make sure that they drain properly. Clogged rain gutters prevent rainwater from flowing down the downspout. This will cause the water to overflow onto the roof of your home. Gutter cleaning is dangerous and time consuming. Let the pros at Spring Hill Lawn Service take this dirty job off of your hands. Safety First: Do heights leave you dizzy? You don’t have to risk your safety just to clean your gutters and downspouts. Accidents are bound to happen if you are afraid of heights. Gutter cleaning isn’t a quick job either. Spring Hill Lawn Service will clean them out so you don’t have to. We are experienced at cleaning gutters and use the necessary safety equipment to prevent accidents on the job. A fully functional rain gutter and downspout system prohibits water from seeping through the roof of your home or commercial building saving you money to repair preventable water damage. Our gutter experts work efficiently taking less than half the time and energy it you take you to rid your gutters of debris, clogs, mold or algae. We aim is to make the process as quick and easy for you as possible. We offer a highly personalized service. We will inspect your gutters before coming up with a free estimate for your convenience. 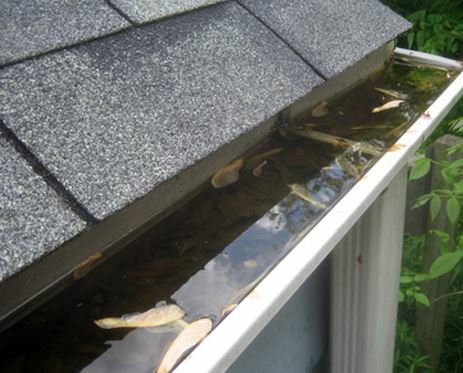 Our affordable gutter cleaning service will be sure your gutters are clean and debris free. Make an appointment to have your rain gutters cleaned by calling 352-269-4848, today.